Including my exclusive “3D” method for writing a provisional patent and my technique for shifting from “inventor” thinking to “patent attorney”-style thinking. Your invention is important to you. Doesn’t it deserve the best provisional application you can write? In a perfect world, you’d have the money and time to hire a patent attorney to draft and file your provisional application. But, we don’t live in perfect world. Situations come up, funds are limited and time is tight. You need a good provisional application, and you need it fast and cheap. 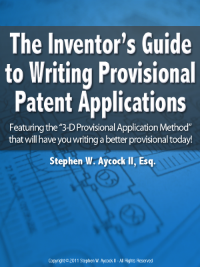 I wrote The Inventor’s Guide to Writing Provisional Patent Applications with you in mind. In my years of practice, I’ve seen provisional applications written by inventors. Some of the applications were OK, but unfortunately many were not. In some cases, a provisional application did not provide any protection at all, because it did not meet the requirements. If you are going through all the trouble to write, file and pay the filing fee for a provisional application, then you might as well put something decent on file. You’ve invested time and energy (and maybe even money) in your invention. If you need to write your own provisional application, doesn’t it make sense to invest a little to learn how to write the best provisional application you can? Don’t risk your potential future patent rights by not taking a little time to get the basics of provisional application writing down. If you are not using an experienced patent attorney or agent, then you must learn how to write a provisional application. My guide will teach you how to write a patent that complies with U.S. Patent and Trademark Office (USPTO) rules and procedures. Without some kind of guide, you may omit something important or include something you shouldn’t. Don’t take that chance. The two parts required in a provisional patent application If you leave one or both out, your application will not be effective. How to find example provisionals on file with the Patent Office For inventions in the same area of technology as your invention. Two questions you must answer in your provisional application. These two questions help you meet the requirements. The purpose of a provisional application and how to make the most of it for your invention. Using my guide is easy and fast. Put it to use in minutes – not hours. I get to the point and give you just what you need to know. Not a bunch of fluff. 1) The Guide in PDF format. This guide contains all of my tips and tricks for writing provisional applications. This sample provisional patent application illustrates the basics of provisional applications. 3) Provisional patent application template in Word format. This can be the starting point for your provisional application. Use this to double-check your application before filing. Plus, I’ll throw in Official USPTO Forms to make things easy for you and to save you $$. Use these fill-in-the-blank USPTO forms for your provisional application. You’ll get IMMEDIATE ACCESS to the guide. I’ve handled hundreds of patent application cases for clients ranging in size from single inventors starting a company to some of the largest and most prestigious corporations and research universities in the world. I studied law and earned my law degree at The George Washington University in Washington, D.C. The George Washington Law School has one of the nation’s highest ranked Intellectual Property programs (according to U.S. News and World Report). In my guide, you’ll get the distilled-down essence of my years of practice experience and formal training. The guide is in plain-English and in an easy-to-use format. Providing good value to my customers is important to me. That’s why you have my personal guarantee: If you are not 100% satisfied with your purchase from me, I’ll give you a prompt and cheerful refund. I’m confident though, that my guide will give you the information you need to write the best provisional patent application you can for your invention. I’m publishing this guide in electronic form so that I can get it to you, my valued customers, as fast and inexpensively as possible. Once your purchase my guide, you’ll have instant access to it and will be able to get started right away. Try a copy today risk-free for only $27 $8. You’ll be glad you did. If my guide doesn’t help you write a better provisional…if you don’t learn something new about provisionals, then please let me know right away and I’ll refund your money. P.S. I’m happy to answer any questions by email or by phone. I want you to know I’m a real person and I’m just a phone call or email away. My email address is steve@provisionalpatentguide.com. If you’d like to talk by phone, just shoot me an email and I’ll send you my cell number. I’m often on calls or in meetings throughout the day, so if you get my voicemail, please leave a message and I’ll get back to you as quickly as I can. I’d be happy to discuss your invention with you either via email or on the phone. I’m admitted to practice before the U.S. Patent and Trademark Office and in the state of Florida. I represent clients from across the U.S. and from other countries in patent, trademark and copyright cases. The “Inventor’s Guide to Writing Provisional Patent Applications” is a personal project of mine and is published and sold for informational purposes only. It is not intended to be legal advice for your specific situation. Nor does your purchase of the guide create an attorney-client relationship. I enter into representation of a client by means of a written engagement letter signed by me and the client. © 2019 Provisional Patent Guide. All Rights Reserved.